This is created entirely with PSP...no filters. This tutorial is entirely my own creation. Any resemblance to any other tutorial is coincidental. The outline image was created by me using PSP Vectors. SUPPLIES: The original vase image. This tutorial was designed in PSP 8 but can easily be done in PSP 7. Open the DCMvaseoutline.psp file. It is in psp format but was saved to be used in PSP 7 also. Notice that it is in two layers. 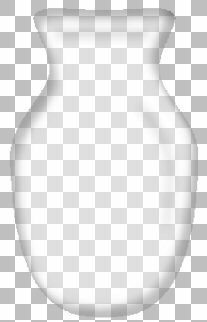 With the bottom layer active and using the Magic Wand tool , select inside the black outline of the vase. Using the flood fill tool flood fill with white. Using the Magic Wand tool select the black outline. Now hit the delete key to remove the black outline. Duplicate this image 2 times. Rename these layers Cutout 1 and Cutout 2. Note that the white color is gone from this image. That's ok. That's why we made a separate layer for the cutouts. The image should look something like this... Not clear is it? We'll fix that. Now you should have a nice clear Vase. SAVE. You need to keep this as a psp file. That way when you want to place it on a flower picture so the stems will show through, you can duplicate the image, merge all visible layers and copy and paste it in the other picture. You can also make a Picture Tube with it. (merge visible then export as a picture tube) Then you can change the size to any you want. Want one that is a color or pattern but still clear? Duplicate the bottom layer, make it active, select it with the magic wand, then flood fill with any color or pattern. See my examples below. Because you are duplicating a layer that is set to be on 50% opaque, this one will automatically be set to be 50% opaque. a picture of a bouquet of flowers. Here's an example with a patterned background. The Fairy Dust pattern had to be applied 3 times in order for it to show up. The fairy dust and the gold pattern are some I created.